Donald observed that the Year 2012 is all about “e-commerce” where we see players like Lazada and Zalora encouraging more Filipinos to buy products online. Although the lack of a 3rd party study prevented Donald from giving a figure on how is the e-commerce volume doing in the Philippines and pegged it at a previous estimate of 5 billion pesos. I think the lack of a reliable industry figure on how e-commerce is growing in our country is hurting us. It puts our country in a bad light and not an attractive destination for e-commerce. Although there are e-commerce players sharing exciting revenue performance, but that is not enough to peg how the whole industry is doing. This is also the reason why I decided to partner with Dr. Nick Fontanilla in coming up with an e-commerce measurement framework and shall discuss in another article. With the government taking an active interest on the growing e-commerce industry, the way we do e-commerce will have to be re-think to balance the interest of e-commerce players, consumers, and government. It is hard to say to the government to leave us alone in this e-commerce space. The consumers are the one who asked for government to take an active role – especially those who became victims of scams, bad deals, and unfulfilled commitments. I agree with Donald that we need to re-think on how we do business. But also, the government has to be proactive enough to adjust also to how online merchants do their business. BIR’s relationship with the online community should not be perceive as adversarial. 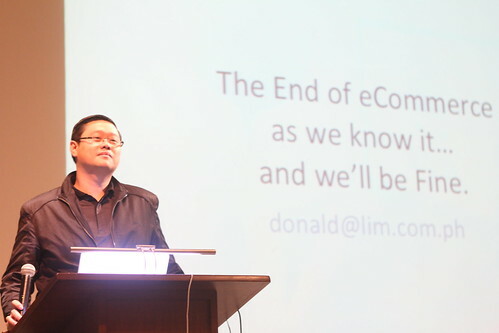 Donald observed that most of us tend to look at e-commerce based on “acceptance of payment online”. He suggested that we should look at the changes in the e-commerce space on a number of layers from platform, payments, currency, and purchase. On platform, Donald emphasized on how Facebook is being used as an e-commerce platform and cited Malayan Insurance as an example on how they did it. I think whoever will provide the platform or tool that will make it easy for businesses to sell items or services through Facebook, that can work with existing content management systems (such as WordPress) or build-your-own shopping sites, will accelerate its adoption locally. Donald poses the question as well if in-game purchases (such as buying Farm Coins in FarmVille) should be considered as e-commerce? Yes, I do think so. From the payment point of view, Donald shared his optimism for platforms like Square that enables an Android or iPhone to become a payment acceptance device and be able to swipe credit cards to get transaction authorization. I think for retailers and consumers to trust, it will be important for payment solutions like these to partner with a local bank. Donald also challenges brands and entrepreneurs to appreciate the value of social currency and showed Kellogg’s Tweet Shop as an example. This is where the size of one’s social network can be used as a currency to acquire a product sample in exchange for a feedback plug. We also need to start thinking about scan to purchase, rather than click to purchase, especially with the growing pervasiveness of smartphone devices. Instead of handpicking items, there will come a time where we will just scan to order them. I guess this can be true especially if you saw items display on-site that you are not ready to purchase as cash, or maybe not available in-store, but can order through the mobile phone to purchase it and be delivered. Donald end his talk by reminding participants that being the 1st remains to be important. The 1st to market, 1st to experience, 1st to learn, will be the 1st to win. The 4th DigitalFilipino E-Commerce Summit roadshow continues with Cebu as the 2nd stop this March 23, 2013.